Clifton R. White, M.D. received his medical degree from the University of California, Los Angeles, and received specialty training in dermatology and dermatopathology from OHSU and New York University School of Medicine, respectively. Dr. White is director of dermatopathology in the department as well as chief of dermatology at the Portland Veterans Administration Medical Center. He provides histologic diagnoses of skin and mucous membrane tissue biopsies to physicians throughout the Northwest, utilizing routine and special stains as well as cell surface markers. He is an internationally recognized dermatopathologist, has published numerous peer-reviewed articles and chapters on the diagnosis of skin and disease, and is the past editor-in-chief of the American Journal of Dermatopathology. 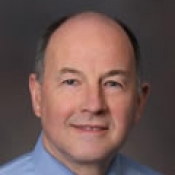 Dr. White has served on regional and national committees and boards, and has directed national and international courses on dermatopathology.